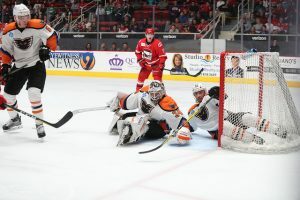 Charlotte, N.C. – The Lehigh Valley Phantoms stormed out of the gates with a pair of early goals on their way to a 5-1 victory at the Charlotte Checkers in Game 3 of the Atlantic Division Finals in the Calder Cup Playoffs. 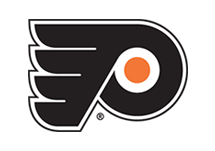 Oskar Lindblom (3rd, 4th) led the attack with a pair of goals while Alex Lyon was spectacular between the pipes with 34 saves including 19 consecutive stops to thwart a third-period Charlotte push. Mike Vecchione (3rd) started the scoring and added an assist while Danick Martel (3rd) and Chris Conner (3rd) also notched lamplighters. Greg Carey contributed a pair of assists in the exciting road win. Charlotte lost in its home building for the first time since March 18. 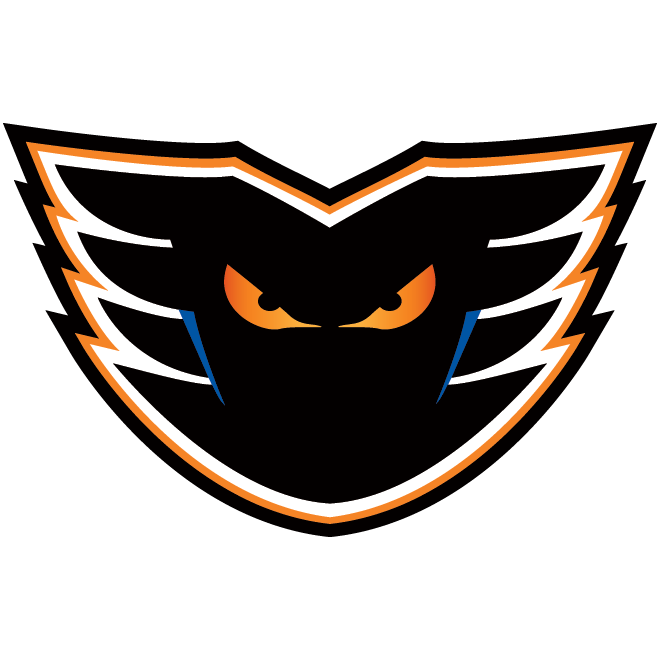 The Phantoms scored four times against Alex Nedeljkovic forcing the removal of the same goalie who had shut out the Phantoms at PPL Center just two days earlier. The Phantoms now hold a 2-1 lead in the series entering Game 4 on Wednesday night in Charlotte. Game 5 will take place on Saturday also in Charlotte. 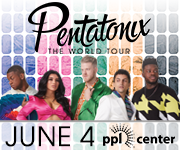 Games 6 and 7 would be back at PPL Center in Allentown on Monday, May 14 and Tuesday, May 15. 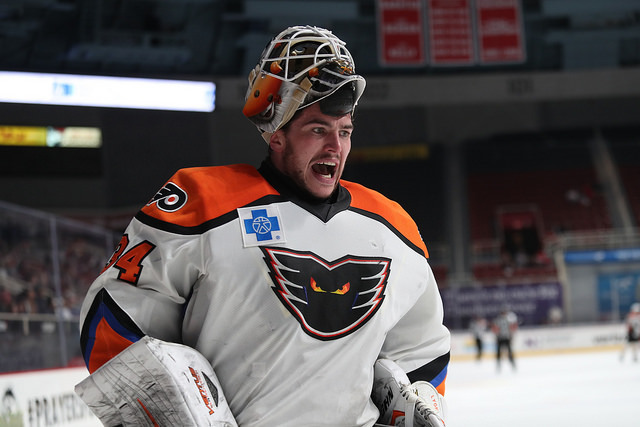 Alex Lyon improved to 4-1 in the playoffs and has been sensational since his return from the Philadelphia Flyers. Including his one game at the end of the regular season against Wilkes-Barre/Scranton on April 14, Lyon has gone 5-1-0, with a 1.89 goals-against average and .945 save percentage in his last six outings. The Baudette, Minn. native has allowed just 12 goals in those six games on 220 shots over 380 minutes. 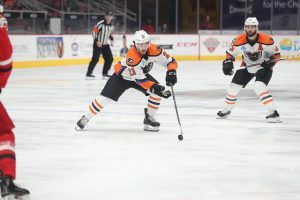 After a couple of strong stops from Lyon to begin the game, the Phantoms found their stride in their determined effort to bounce back following a Game 2 setback at home on Saturday. Greg Carey connected with Mike Vecchione whose shot off the pad of Nedeljkovic created a juicy rebound to be put in on the backhand by Vecchione himself for a 1-0 lead at 3:16 into the game. T.J. Brennan also assisted on the play marking his 45th career point in the Calder Cup Playoffs, most of any current Phantoms player. Just 84 seconds later it was Misha Vorobyev connecting up the right wing with Danick Martel who curled and weaved his way through the Charlotte defense from the right and into the slot. While being tripped up with a penalty about the be called, Martel was able to get off a shot while falling to the ice that he somehow curled through the skates of the Charlotte netminder for a 2-0 lead less than five minutes into the game. Radel Fazleev pushed the puck to Vorobyev to also receive an assist on the goal. 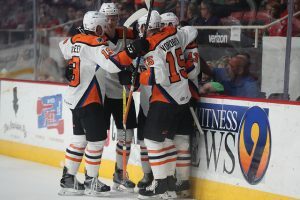 The Phantoms boasted a regular-season record of 30-4-6 when scoring the first goal and would also improve to 3-0 in the postseason when tallying the first marker. Charlotte offered some significant pressure in the first period and out shot the Phantoms 13-8 but Lyon was stellar right from the start. Lehigh Valley similarly had several quality counter-strikes, some of which that did not even qualify as shots on net. A bank pass clicking with Martel for a breakaway could very easily have resulted in a 3-0 lead but he pushed the puck just wide of the left post. And a hopping puck mishandled to the side of the cage bounced right in front of an open net but Colin McDonald missed on his chance to pull the puck back in towards the empty cage when the puck appeared to bounce on him while he momentum carrying him towards the end-boards. Charlotte closed the deficit with an early second-period strike on the power play from Valentin Zykov swatting the fluttering puck in mid-air at 3:40 into the second period. 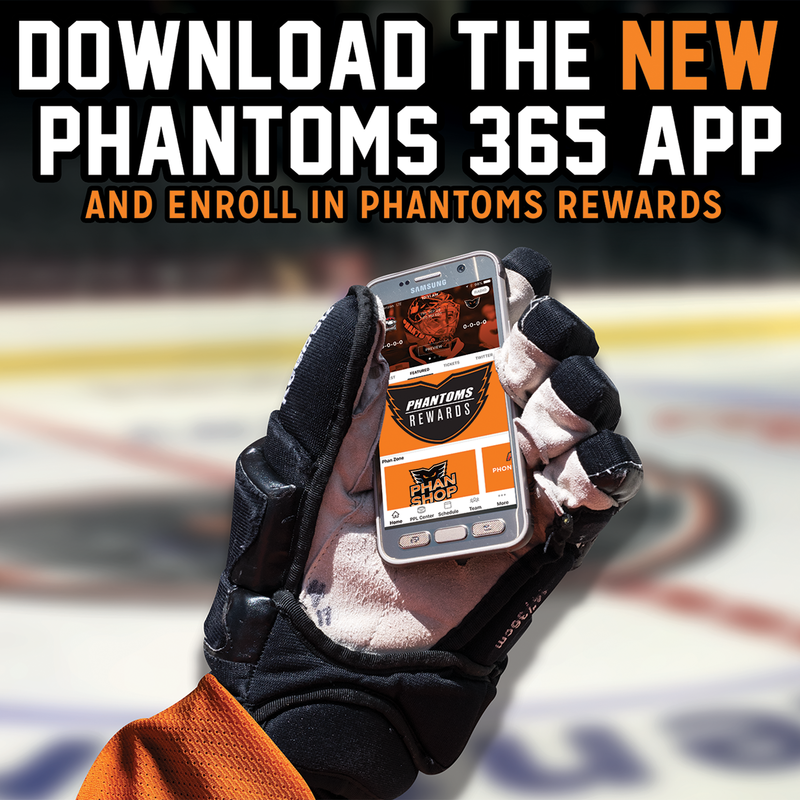 But the Phantoms responded less than two minutes later with Philippe Myers hustling back into his own end to retrieve the puck from a Charlotte winger. Vecchione found Conner flying up the right-wing who snapped through his third goal of the playoffs to the left of the cage past the blocker of Nedeljkovic for a 3-1 lead. 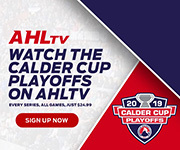 Chris Conner’s seventh point of the Calder Cup Playoffs leads all Phantoms. 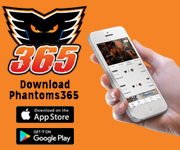 It was also Conner’s 21st career AHL Postseason assist and his 31st point for the 34-year-old winger who is the eldest of the Phantoms players. Lehigh Valley boosted its advantage at 12:52 into the middle frame on a power-play tap-in for Oskar Lindblom. Colin McDonald retreated to the right point for a nice keep of a clearing try and then connected directly across to Max Lamarche on the left point whose shot off the left pad of the Charlotte netminder opened a rebound opportunity on the backdoor for Lindblom and a 4-1 lead. That spelled the end of the night for Nedeljkovic who was removed in favor of veteran backstop Jeremy Smith. The Phantoms dominated play in the second period with a 10-3 shots advantage and boasted a 4-1 lead on the scoreboard into the locker room for the second break. 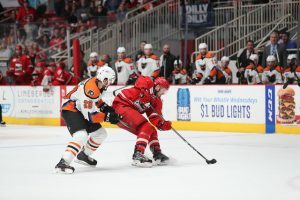 The tables would be turned in the third period with the desperation and urgency of the trailing Charlotte Checkers on full display. The hosts ran up a 19-2 shots advantage in the final frame but Lyon was up to the task with saves on every Charlotte opportunity including a couple of ridiculously spectacular denials along the way. One stop was a sprawling dive to his left while practically pulling the splits to somehow get a glove on an in tight opportunity from the right circle that appeared to be a certain goal. On another play, Reece Willcox rotated in behind Lyon for an apparent kick-save of his own right on the goal-line. Charlotte pulled their goalie, Jeremy Smith, when they had a late third-period power play. The Phantoms killed the 6-on-4 and then Greg Carey raced out of the box to steal the puck from an unaware Brendan Kichton at center-point. Carey was in the clear when Kichton’s stick went flying and he gave a football-style tackle of the Phantoms top goal-scorer. The ensuing penalty proved to be a moot issue when Lindblom walked up and scored an empty-netter moments later to seal the 5-1 victory in Game 3. Charlotte out shot the Phantoms 35-20. Lehigh Valley was 1-for-2 on the power play while Charlotte finished at 1-for-4. 2nd Period-3, Charlotte, Zykov 4 (Wallmark, Carrick), 3:40 (PP). 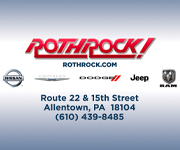 4, Lehigh Valley, Conner 3 (Vecchione), 5:37. 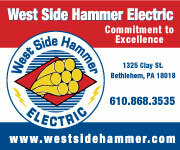 5, Lehigh Valley, Lindblom 3 (Lamarche, McDonald), 12:52 (PP). Penalties-Krushelnyski Lv (closing hand on puck), 3:30; Carey Lv (slashing), 7:57; served by Saarela Cha (bench minor – too many men), 10:56. 3rd Period-6, Lehigh Valley, Lindblom 4 (Carey), 16:38 (EN). Penalties-Martel Lv (slashing), 5:31; Carey Lv (cross-checking), 14:26; Fleury Cha (cross-checking), 18:27. 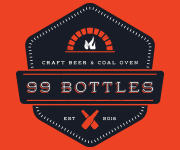 Shots on Goal-Lehigh Valley 8-10-2-20. Charlotte 13-3-19-35. Power Play Opportunities-Lehigh Valley 1 / 2; Charlotte 1 / 4. 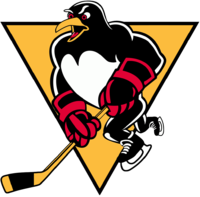 Goalies-Lehigh Valley, Lyon 4-1 (35 shots-34 saves). Charlotte, Nedeljkovic 4-2 (15 shots-11 saves); Smith 0-0 (4 shots-4 saves). Referees-Chris Schlenker (48), Jeremy Tufts (78). Linesmen-Libor Suchanek (60), James Tobias (61).